You want your wedding day to be joyous and memorable, right? “I do,” you say. That means a personalized ceremony that’s filled with heartfelt and humorous reflections on you, the happy couple. As an ordained officiant, Taren Sterry can legally marry you, draft a personalized script for the ceremony, and help you write your own vows. What does Taren’s fee include? A typical ceremony lasts between 15 and 30 minutes, depending on how much you’ve decided to personalize the script. Taren is always happy to stick around afterwards, pose for pictures, and meet your family and friends. How much does all of this wonderfulness cost? Taren’s fee ranges from $650 to $900, depending on the location. Who is responsible for obtaining the marriage license? You are responsible for obtaining the license and bringing it to the ceremony. Taren will complete the license and obtain the necessary signatures on the day of the wedding, as well as returning the signed documents to the appropriate municipal office. Depending on the state in which you reside, you may request the marriage certificate from your county clerk. 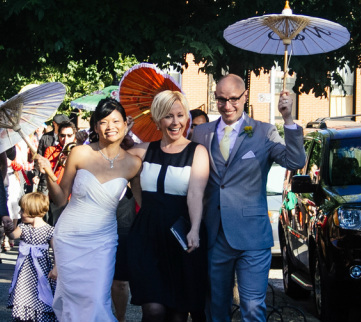 Watch this beautiful video of a wedding I officiated in Brooklyn in 2014. "Taren officiated our wedding and was a huge contributor to everyone's great time. How many officiants can get the entire audience howling within five seconds of "Dearly beloved..."? She worked with us to design exactly the program we wanted, and everyone was smiling." "I first met Taren through presentation training a few years ago. She was so wonderful I knew, when I got engaged that I wanted her to be the officiant at our wedding. She gave us guidance on our vows, calmed our nerves and brought such a lovely positive energy to one of the most important moments in our lives. I could not recommend her more. Whats more our friends and family adored her!"